With Halloween creeping upon us, I have found some super cute Halloween ideas to make this year. Why should the US have all the fun? I know my kids get super excited when they start seeing all the Halloween decoration. Then the start of the countdown begins the week before, planning their costumes and working out where their little feet will take them around our neighborhood “Trick or Treating” and collecting all their goodies. So, I thought why not make these super cute friendly little ghost lanterns and the all-important “Trick or Treat” goodie bags. We recommend using Red Heart Super Saver in white which we currently have available in stock at American yarns. 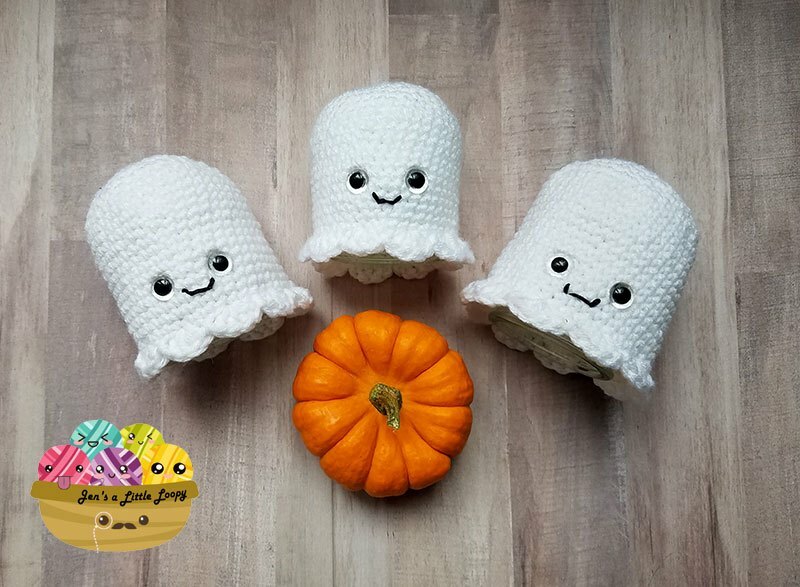 For this easy to follow free pattern please click on the link below: https://www.jensalittleloopy.com/glowing-crochet-ghosts-halloween-craft/. This little project will take you up to an hour or so from start to finish and most of the materials needed you will probably have at home or can be easily found at a very low cost. I got my two boys aged 3 and 8 involved by letting them design the little ghost faces and who doesn’t love googly eyes. Once the friendly little ghosts have been crocheted and decorated, upcycle a small glass jar and remove the label. I found the best method for removing labels was leaving the jars in the sink completely covered in very hot/boiling water. Add some dishwashing detergent to loosen the labels and leave submerged in the water for a short time until the labels become soft. They all mostly peeled off clean and the ones that didn’t, I just used a steel wool ball and scrubbed off the excess. Note: Please be careful removing the jars from the hot water and then handling them straight after to remove the labels as they will be super-hot. The baby food glass jars would be perfect but I just adjusted the sizing of the pattern to fit the jars I had at home. Finally, add a battery-operated tea light candle which can also be found at the cheap shops into your jar. 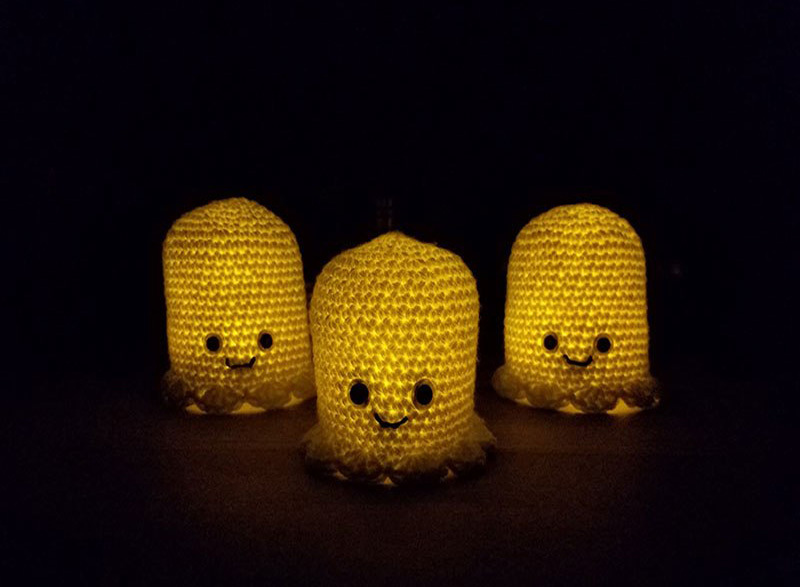 Then place your crocheted ghost over the jar and there you have it, your very own friendly little ghost lanterns. “Trick or Treat” goodie bags. I recommend you use the Red Heart Super Saver in the colour“Pumpkin” for the base/pouch part of the bag, which in this case is very fitting for this project. 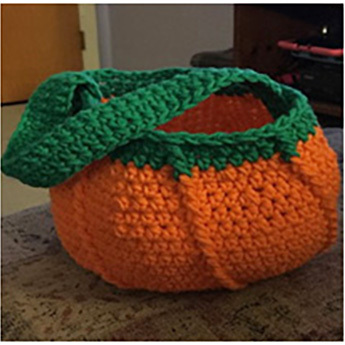 Then for the handles, I would suggest switching it up and changing the colour from the “Pumpkin” which is what the patterns suggest using for the entire bag, shown above n pic 1 to a more natural green. Which in my opinion is a better representation of what a pumpkin looks like shown above in pic 2. We at American yarns have several different shades of green to choose from in all the popular brands including the NEW Premier Deborah Norville non-pilling Eeveryday range. It’s 100% Acrylic, and Christmas green in the premier range is a great colour match and would also be a great cost effective option. It is a smaller ball of wool and you won’t need as much for the handles as you do for the base. Or you can alternatively have a look at our online store for all our bestselling yarns in a great variety of colours and fiber blends, perfect for this project and many more to come. 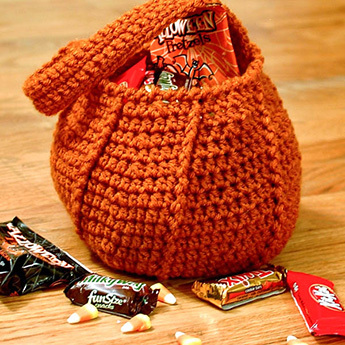 Your kids will go crazy for this and let’s face it, kids represent Halloween with 3 things. It would have to be the lollies, chocolate and everything sweet they get. The ability to scare each other, BOOOOOOOOOO. And from past experiences, they do come back with a lot of Sweets, an absolute sugar overload. Any parent’s worst nightmare, Right? SO, let’s look at this scenario in a different way!